The 9th Society of Scientists Singapore (SCSS) Suppliers Day (24 August 2018) will also host a special workshop, Creating High Internal Phase (HIP) emulsions, presented by Belinda Carli, Director of the Institute of Personal Care Science, Australia. HIP emulsions can provide unique sensory and performance attributes and the workshop will demonstrate how easy it is to create them. 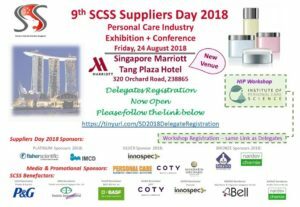 SCSS Suppliers Day also has a new venue for 2018, the Singapore Marriott Tang Plaza Hotel.